Video clip synopsis – The Yugal Cattle Co was given a grant of $336,000 to go into business running a cattle station. Their dreams of making money from cattle and beef export are big but there are problems. Traditional Indigenous laws are different from white man's law. Broadband MP4 yugal_bb.mp4 (8.2MB), suitable for iPods and computer downloads. 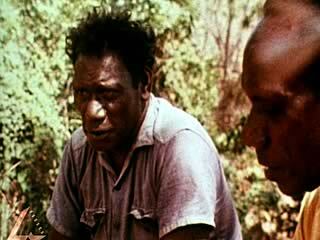 Indigenous Business – A Cattle Station is an excerpt from the film The Yugal Cattle Company (8 mins), produced in 1973. In many areas of the country Aborigines were placed on reserves and missions where white management had total control over their Aboriginal lifestyle. The hunted and gathered foods were replaced with high carbohydrate rations. Language and ceremonies were forbidden. The colonists brought with them their social order and notion of property and Christianity. Aboriginal men were drastically losing their role in society. The women were used as domestics and sexual partners for the white invaders. In 1971, an Aborigine artist, Harold Thomas, designed the Aboriginal flag in the colours red, black and yellow. Black for the people, the red for the earth and the yellow for the sun, the giver of life. In the early 1970’s, the first major department for Aboriginal affairs was structured under the federal Labor government. Money was allocated for housing, health, schooling and various projects. This was a form of compensation to try to overcome the poverty among Aborigines. Most of the funding went to white public servants in the administration, and little reached the grassroot-levels. At this time the Gurindji people of the Northern Territory, after a long-standing campaign, were given some landrights. Since then there has been much legislation and government inquiries into landrights and heritage acts. Explain why this Indigenous group is operating a cattle station business venture. Comment on whether the group is able to set up and run its business successfully without reliance on assistance from outside the Indigenous culture. Describe the problems the group’s traditional Indigenous culture faces in the venture. Describe how the group plans to deal with, or solve, these problems. The video clip is a sequence from a film made in 1973. Following on from the previous activity, in pairs research then write a short report on the extent and success today of federal and state/territory government funding for setting up Indigenous-controlled business operations. Include information as to what each business venture needs to do to qualify for assistance.